The Festival will look back in tribute to composers with deep historical relationships to Ojai – Igor Stravinsky, Arnold Schoenberg, and Olivier Messiaen – and will look forward to major voices of our time, including Gerard Grisey, Mark-Anthony Turnage, John Luther Adams, and John Zorn. The 73rd Ojai Music Festival, June 6-9, 2019, celebrates and explores the creative breadth of Music Director Barbara Hannigan, as conductor, singer, and mentor. Joining Ms. Hannigan will be the US debut of her mentoring initiative for young professional artists, Equilibrium (EQ), as well as the US debut of the orchestral collective from Amsterdam, LUDWIG, with whom Ms. Hannigan made her Grammy Award-winning conducting debut CD “Crazy Girl Crazy” in 2017. “What does the Ojai Music Festival mean to me? Possibility. Embrace. Challenge. Electricity. Resonance. The Ojai Festival is an atelier where we are invited to gather, as audience and performers, where we are in communion with one another, witnessing the act of live performance. Storytelling, dramaturgy, heart to heart exchange are at the center of my programming choices. This Festival will be a synthesis of dark and light – chiaroscuro – and brings the human voice to the forefront of many events, exploring the various ways composers have been inspired to express themselves through the interplay of text and music. The 2019 Festival marks the sixteenth and final year under the artistic direction of Thomas W. Morris. As the Ojai Music Festival approaches its 75th anniversary and looks toward the future, the innumerable contributions by Mr. Morris will continue to be realized through the 2019 Festival and beyond. Under his creative watch, the Festival pushed boundaries and scope; explored each music director’s individual perspective, creativity, and artistic communities; invited an ever-broadening roster of artists; expanded in scope into an immersion experience over four days; introduced live and archival video streaming of concerts and talks; and built connections across musical communities with through-curated programming for each Festival. “One of the most rewarding parts of my artistic director responsibilities has been selecting the annual music director – an ever-evolving process informed by the extraordinary resilience and receptivity of the Ojai Music Festival and its audience, as well as the astonishing wealth of artistic talent that exists. The world of music is so different than it was sixteen years ago with the artistic possibilities exploding, the breadth and depth of creative talent expanding, artificial boundaries between genres disappearing, and the appetite for audiences for more intense and distinctive musical experiences increasing. It is those forces that have propelled the sequence of music director appointments over the years – from a singer, to a pianist, to a choreographer, to a pianist/author, to a percussionist/conductor, to a stage director, to an improviser/composer, to a violinist, and to a singer/conductor/mentor. I would be less than honest to admit that this was a sequence well thought out in advance; in fact, the process was organic – an evolving adventure as each music director opened up new possibilities for the next in the context of an ever-changing environment. In many ways, Ojai is an ever self-reinforcing and regenerative flywheel of creativity. Launching the Festival concert line-up on Thursday, June 6 will be Ms. Hannigan’s work from the podium, Stravinsky’s neoclassic opera, The Rake’s Progress, a Faustian fable for our time addressing the subjects of love, laziness, and greed. Anne Truelove was one of the first operatic roles Ms. Hannigan ever sang, and the opera holds a special place in her heart. Ms. Hannigan conducts this semi-staged performance featuring members of her Equilibrium mentoring initiative as the cast and the Los Robles Master Chorale in their Ojai debut. The production, directed by Linus Fellbom, is a co-production with the Gothenburg Symphony in Sweden, the Klara Festival in Brussels, the Munich Philharmonic in Germany, plus the Aldeburgh Festival. The Rake’s Progress is new to Ojai with the exception of a performance in 1962 of one scene from the opera, and has been very rarely performed in Southern California.During the Festival, Ms. Hannigan also conducts works by Arnold Schoenberg, Igor Stravinsky, and Claude Vivier. As a singer, Ms. Hannigan will perform Gérard Grisey’s masterpiece, Quatre chants pour franchir le seuil,a 45-minute song cycle for soprano and 16 instruments which explores the passage from life into death. Quatre chants pour franchir le seuil, completed just days before Grisey’s death, will be conducted by Ojai’s 2015 Music Director Steven Schick. Ms. Hannigan will perform in Arnold Schoenberg’s sensual String Quartet No. 2 for soprano & string quartet with the JACK Quartet. Ms. Hannigan will serve as both singer and conductor in Girl Crazy Suite, a touching and infectious arrangement by Tony-award winning Bill Elliott, which is part of Hannigan’s 2017 Grammy-winning album Crazy Girl Crazy, that will close the Festival on Sunday, June 9. Also featured will be Ms. Hannigan and pianist Stephen Gosling performing the US premiere of John Zorn’s Jumalattaret, an extraordinary quest for soprano and piano inspired by the goddesses of Finland’s Kalevala saga. In January 2017, Ms. Hannigan launched the Equilibrium (EQ) initiative to mentor 21 young professional musicians in the first substantial phase of their careers. EQ includes intensive workshop retreats, which focus on developing and strengthening the skills needed for sustaining a fulfilling career, as well as offering performance opportunities with Ms. Hannigan and others. EQ artists are selected from an international field of applicants for their talent, musicianship, passion, drive, curiosity, discipline, versatility, and creativity. Seven of these young artists will form the cast of The Rake’s Progress, as well as perform additional music by Igor Stravinsky, Claude Vivier, Mark-Anthony Turnage. On Saturday, June 8, the singers will participate in a special program of folk songs from their diverse native countries entitled, Rites of Passage. LUDWIG, the celebrated collective from Amsterdam, with whom Ms. Hannigan works closely and collaborated with on the recent Grammy and Juno award-winning album Crazy Girl Crazy(Alpha Classics), makes its Ojai and US debut with the 2019 Festival. Formed in 2012, LUDWIG distinguishes itself artistically and in terms of its range and flexibility. Varying in size from a single soloist to a full-scale symphonic orchestra, LUDWIG carefully crafts its diverse programming. In 2015, LUDWIG received The Art of Impact grant for their pioneering research project Ludwig and the Brain, which, in cooperation with leading scientists, explores innovative ways music can have positive effects on health and education. 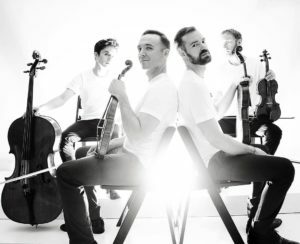 The JACK Quartet, which made its Ojai debut at the 2018 Festival, returns performing Schoenberg’s String Quartet No. 2 with Ms. Hannigan as soprano, Marc Sabat’s Euler Lattice Spirals Scenery, Tyshawn Sorey’s Everything Changes, Nothing Changes, Catherine Lamb’s String Quartet, and a two-part concert of works by John Zorn, including three piano trios with Stephen Gosling, and two quartets The Unseenand The Alchemist. Deemed “superheroes of the new music world” (Boston Globe), JACK is dedicated to the performance, commissioning, and spread of new string quartet music. Comprising violinists Christopher Otto and Austin Wulliman, violist John Pickford Richards, and cellist Jay Campbell, the group collaborates with composers of our day and was recently named the 2018 Ensemble of the Year by Musical America. 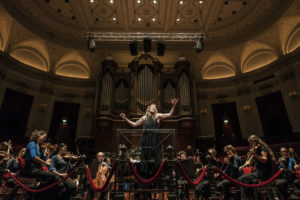 Additional featured music includes Terry Riley’s seminal In C, receiving its second Ojai Festival performance and featuring 2019 Festival artists and William Walton’s entertainment, Façade, a concoction for speaker and six instruments on humorous poems by Edith Sitwell, will be narrated by Barbara Hannigan and surprise guests. The Festival continues to build on its commitment to reach broader audiences with several opportunities for the community to experience Festival offerings. Over the course of the first three afternoons of the 2019 Festival, percussionist Steven Schick will perform the eight movements of John Luther Adams’ The Mathematics of Resonant Bodies. Works by John Luther Adams have been performed for Ojai audiences and have included Sila, Inuksuit (co-commissioned by the Ojai Music Festival), and recently Everything that Rises performed at the 2018 Festival. For the first time since 2014, the Ojai Music Festival welcomes the return of Ojai Films, a series of two screenings during the weekend at the Ojai Presbyterian Church, while the Ojai Playhouse continues its reconstruction. On Friday, June 7 the Festival will include, I’m a creative animal: A Portrait of Barbara Hannigan produced in 2014 by SRF and directed by Barbara Seiler. On Saturday, June 8, the Festival will present the US premiere of Taking Risks, a documentary produced by Accentus Music on the birth of Equilibrium which follows its inception through all stages of the casting and production, and culminating in the world premiere of the semi-staged production of The Rake’s Progress (which is performed in Ojai June 6) in Gothenburg in December 2018. The 2019 Festival begins with Ojai Talks hosted by Ara Guzelimian, former Festival Artistic Director and current Dean and Provost of The Juilliard School. On Thursday, June 6, a three-part series of discussions will begin with an exploration of Barbara Hannigan’s Equilibrium (EQ) initiative, with Ms. Hannigan and EQ artists. Mr. Guzelimian will interview Thomas W. Morris on his sixteen-year tenure as Ojai’s Artistic Director for the second part, and the third part of the discussion series will speak to the reinvention of musical groups, with members of LUDWIG. Additional on-site and online dialogue during the 2019 Festival includes Concert Insights, the pre-concert talks at the Libbey Bowl Tennis Courts with Festival artists led by resident musicologist Christopher Hailey. Pre-concert interviews with artists are broadcast through the Festival’s free live streaming program, hosted by content-expert individuals.